I used to go to an old café with my father to have afternoon tea when I was a little kid. The café was very cozy and would sell freshly baked cakes and breads around 3 to 4pm. Although the café was not big, their cakes baked in paper (纸包蛋糕) was very popular that attracted many customers. A long queue would line up in front of the entrance of the café. Actually, cakes baked in paper are very popular in Hong Kong. You can easily get them from many bakery shops there. If you have a chance to travel to Hong Kong, I recommend you to have a go for it. You won’t be disappointed except you buy the not-the-good ones. I guess you can’t find them anywhere else except in Hong Kong. Or you can bake some for yourself or your family at home. See, the texture of the cake is very light and fluffy. It's very fragrant too. Preheat the oven to 180C. Melt butter in a microwave oven or heat over boiling water in a bowl. Separate the egg yolks and the egg whites. Add the melted butter into milk, then sift cake flour into it and mix well. Add whisked egg yolks and vanilla extra into the mixture, mix thoroughly. Use an electrical mixer to beat egg whites for 3 minutes, then add cream of tartar and blend again. Pour sugar in the egg whites and blend until very stiff peaks form. Fold egg whites into the flour mixture gently with a rubber spatula just until all ingredients are incorporated. Do not stir or beat. For a better result, fold in egg whites with small amount at a time for 3 times. Pour batter into cup cake molds that are already lined with baking paper. Bake at 180C for 25 to 30 minutes. Check with a toothpick to see if the cakes are done. If the toothpick comes out of the cake clean, then they’re ready. Allow the cakes to cool for a minute or two in the pan, then transfer to a wire rack to cool completely. I tried your recipe today, and it turned out wonderful! My mother liked it even better than the ones in the bakeries, and even my father, who is a picky eater, liked the cake. Thank you so much for sharing this wonderful recipe! It's good to hear that your parents liked the cakes! Thanks so much for leaving your kind words...very encouraging! How big is the paper, what shape is it, and how did you arrange it? Thank you so much, looking forward to making it! I just trim the baking paper along the sides of the tin moulds that are especially made for baking this kind of cake. The shape of a tin mould is like a V tube, 8cm width at top, 5cm width bottom, 6.5cm height. I bought them from Hong Kong. If you don't have such kind of these tin moulds, I think you can use similar shape of muffin tins and try baking some to see how they go. Great I've been looking for this recipe for ages!! I can find this very light cake in my local Chinese bakery (I live in the UK), but I've always wanted to make them! so yummy so spongey :=) still looking for those sold in the hong kong bakery tho... it's somewhat not spongey and softer. wonder if it uses less egg whites... this recipes turns out more like chiffon in texture.. 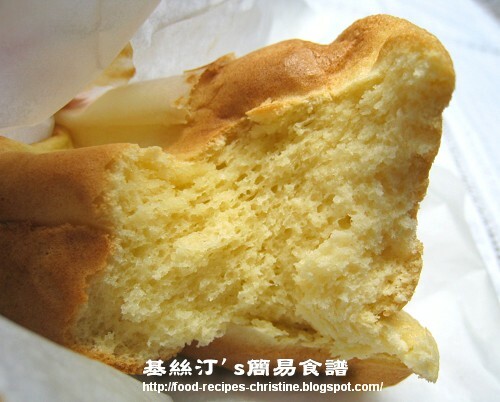 It's not difficult to make this light cake, just like the ones available at Chinese bakery. Worth trying. You might like to use more egg whites to see if the cakes would turn out to your preference. I just came back from Hong Kong and couldn't find this kind of light cake at some bakery shops. I've been searching for a paper wrapped cup cake recipe for a while to make for my kids who love this. So thank you for providing this easy to make version. I would also love to know where you bought that cupcake mold from? I can't find it anywhere online. PS - Love the authentic Cantonese recipes. Keep them coming! The cupcake molds were bought at this shop in Hong Kong. Unfortunately, customers can only place order online, and have to pick up by themselves. I tried to make it. Unfortunately, it didnt come out good. I didnt have those kinda baking tins, so I used regular muffin tins. It was a lot smaller. The top part was sticky, after i let it sit to cool down for a long time. The bottom part did not rised at all (i dont know how to explain). It looks like it wasn't totally baked. only the middle part tasted like what it should be. I once used muffin tins to bake these cup cakes. Although they looked shorter than the ones baked in the right moulds, it tasted great. I think your cakes were undercooked, either without enough baking time, or the temperature was too low. You might check your oven to see if the temperature is right or not. actually my baking time was longer than what it should be and I followed the temperature from your recipe. i've just bought a taller tin the other day, so I'm going to try it again. If i fail again, it must be my problem. thanks Christine. Hope you'll make it this time. BTW, what kind of oven do you have? Conventional one or the other? I'm using a conventional oven. Is that good? I also have a regular toaster oven. 180C is very low, right? i just want to make sure. When you say to fold the egg into mixture. I don't quite understand what that means. Thanks for your help. That's good! I also used the conventional oven to bake this cup cake. When you fold the egg whites into the batter, you don't beat them. Just use a spatula vertically “cut” into the batter to the bottom. Gently turn half the batter over onto the other half. Don’t stir because you don’t want the air in the whites releasing out. Repeat this action until the batter incorporate the whites completely. Never use an electric mixer for this job. yay! can't wait to try tomorrow! hopefully my yehyeh will like them! In Germany's supermarket, I can only find white flour(people also use this to make cakes), but not the "cake flour". Do you think I can use the white flour instead? Actually what are the different of them? Another point is I don't understand the "cream of tartar", is it same as the "tartar sauce"
There are different flours we use for cooking. As for cake flour, it has a lower protein level than the plain flour. And cake flour has the least amount of gluten of all wheat flours, so it delivers a delicate and tender crumb and crust. 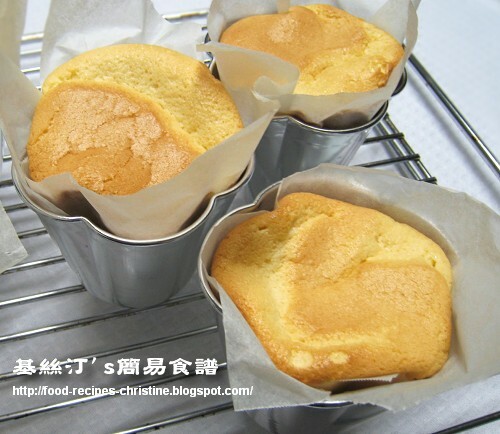 It's ideal for making sponge cakes and this Hong Kong cup cake. “Cream of tartar” and “tartar sauce” are two different things. “Cream of tartar" comes in powder form, that is the common name for potassium hydrogen tartrate. Take a look at this article. Cream of tartar helps to stabilize egg whites, increasing their heat tolerance and volume. I have been told cake flour is similar to (or is)ordinary self-raising flour in the UK and you can get cream of tartar at Tesco. Thanks for the recipe Christine! !...my stubborn 5-months pregnant wife is a very content woman now...and I can get some sleep. Hi Christine I was wondering if I don't have the cup molds, what else can I use instead? Thank you. I tried to use ramekins lined with baking paper before. The taste and texture were good, yet the size and shape were different. You might try any bakery cups to see how it goes. If you're in Brisbane now, it's easy. Mine was brought from Asian stores. Yuen's（袁氏）, 頂好, 寶島...they all got cake flour available. It's called “低筋粉”. I just asked for English version recipe. I made the cup cake and they turned out so delicious, just like the way I love it. I've been seaching for this recipe a long time. So lucky that you share it with us. Hope you best of luck and thank you so much. I want to add almond slices or raisins on top of the cake. When is the time to add almonds or raisins without burning them? I have been looking for this recipe for a long time and I was wondering how you keep it from deflating while the cakes are cooling. My problem is that the cakes goes flat and the bottom is hard. I have been turning the cakes upside down to cool and it works but when I make these I am afraid the cakes will fall out of their tins. Is your secret really is to take them out of the tins while still hot and let them cool on a rack? Your problem is “that the cakes go flat and the bottom is hard.” It seems that you mightn’t have beaten the eggs whites properly, or the egg whites not folded in well. Did you test your egg whites? These cup cakes would shrink a little bit when they are cooled down. I just turn them out from the tin and let cool on a wire rack without turning them upside down. It won’t make a big different if you do so. Where did you get those cups? I bought them from Hong Kong. If I don't have any muffin mold, can I use a big round cake mold to make this cake instead? yes, you can as long as your baking pan is not too large. And you have to revert the cake upside down once they are removed from oven because this cake is very light and fluffy, they'd easily shrink in the middle. Hi there, I have read a couple of your dessert recipes and quite a few of them are using cake flour. I'm living in Scotland and I have been to normal supermarkets and Asian stores butI really can't find any cake flour here. Is there any alternative flour I can use? I really want to try this paper-wrapping cake, which is my favour. If you can't find any cake flour, you may mix 80 grams of all-purpose flour and 20 grams of cornflour thoroughly, to see how it goes. Could I substitute the cake flour with Hong Kong flour? When you say "Hong Kong flour", what is it? I don't get it. Hi Christine,I've have been trying to make this for a looooong time, maybe 2 years it always end up bad, the botton is always thick and yellow and just not the way it suppose to be..
however today I tries it again doing each step by step carefully and it's perfect!!!!!! hehehehe !!! !Thanks a lot!!! made it again today...it was huge!!!!!!!!! I don't know why those i made today is a total failure,,it is very stiff ....i didn't the dameway of the ones that were good?????????????? Great recipe! Any tip to avoid or reduce the sinking on top as the cake cools? Once remove from the moulds, let the cakes rest on sides on a wire rack. It can help. Hi Christine, I have been searching for this recipe, thank you for posting. I would like to try it. Can you convert 100 grams of flour into cups? I tried to find a converter online but they all gave different answers. Hi, thank you for dropping by. This cake is my childhood snack. So glad that we could connect on blogs through the craving of this humble cup cake. 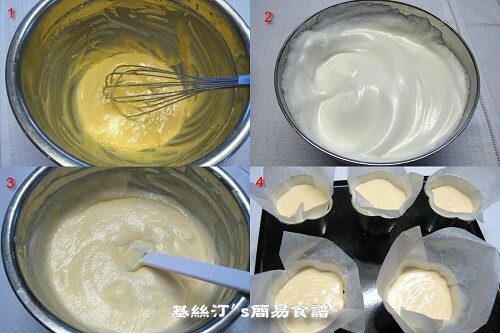 The function of cream of tartar is to stabilize the beaten egg whites and helps the cupcakes from shrinking too much. I m so happy to come across this recipe of yours! Can't wait to try it out! Thank you for sharing all your recipe , I am a fan of your japanese cheese cake and tangzhong bread too!! Im trying to make these cupcakes for my daughter's class project. The top part turned out fine but the bottom half smelled so eggy. Did I cook them long enough? I'm afraid so. Did you test your cup cakes with a needle? If the whole cup cake was cooked through, the needle comes out clean. Just baked some the whole house smell so nice, but my cake don't rise that much guess I might have over mixed the yolk mixture (I use the kitchenAid mixer) as it turn out a bit gummy and gluten. I use the muffin tray to bake. How can I improve my Wiping skill. As the yellow mixture is a little thick by the time I incorporate both white n yellow together my white have deflated. Seems that your batter was over-beaten. KitchenAid is good for beating egg whites. But for mixing the egg yolk mixture and folding in the beaten egg whites, just use a spatula. It'll be better. There're two links to my videos on how to beat egg whites and how to fold-in egg whites. They might help. You might substitute it with 2 teaspoons of fresh lemon juice, drained through a fine sieve. HI Christine, i tried your recipe, followed them step by step properly. I dunno what's wrong with it, but it didn't turn out like yours. It seems like it didn't rise enough, the middle part felt like it was undercook, and the cake is very stiff. the batter was runny when i put it in the oven, is it supposed to be that way? how do i beat the egg yolks? just lightly beat it? The batter shouldn't be runny, but fluffy. Might be the problem of beaten egg whites. Thus your cakes became stiff. Hey Christine, I've followed your site for a while but this is my first comment. I'm from HK and loved these paper wrapped cupcakes, thanks so much for the recipe! I'll definitely try it out. Quick question - do you think the texture would be any different if I used all purpose flour instead of cake flour? As cake flour is low protein flour, it helps make softer and smoother cakes. For preparing the baking paper lined in cups, you don't need to buy any ready-made things. Just cut out a square baking paper, 19cmx19cm in size, that will suit a cup cake tin 8cmx6.5cmx5cm and then line it referring to this video "How To Line a Cup Cake Tin". hey im wondering how u mix the egg yolks?do i just whisk it until combine or do i need to whip it until ribbon stage? Take it easy with egg yolk mixture. Just use a balloon whisk to combine the ingredients well. Make sure not to over beat the batter. Thanks Christine for the great recipe. I used it to bake in a tube pan and it turned out good, but small. Would it give me the same great texture and taste if I doubled the ingredients to make a bigger cake? Would I still bake for 25-30 mins? Thanks in advance! By the way, the corn starch mix all purpose flour worked well! This recipe should work as well if you double all the ingredients. It depends on how deep the cake pan you use. Start trying 30 minutes and test with a clean needle or skewer. If it's not cooked yet, continue to bake for a few minutes. The egg whites should be beaten to the stiff peak form, and fold in lightly, then your cakes won't collapse. Is it possible to add green tea powder without upsetting the balance of the batter? If the amount of green tea powder is not too large, I guess it won't. Say, start trying with 2 teaspoons to see how it goes. I made these and it tasted great when it first came out of the oven, but then it was a bit "tough" and like rubber the next day. I think the egg yolks part I didn't do right...do you use a whisk to beat the egg yolk? The texture of this cake is very soft and fluffy. Wonder if you had over-stirred the batter. Please take a look at the video, showing how to fold-in the beaten egg whites. There's a link on the side bar of my blog. It might help.